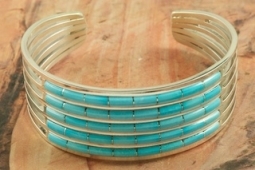 Stunning Bracelet featuring Genuine Sleeping Beauty Turquoise inlaid between ribbons of Sterling Silver. The Sleeping Beauty Turquoise mine is located in Gila County, Arizona. 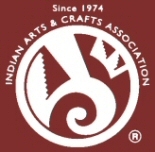 Created by Zuni Artists Anson and Letitica Wallace. Signed by the artists. The Zuni Pueblo is located in New Mexico, Land of Enchantment.